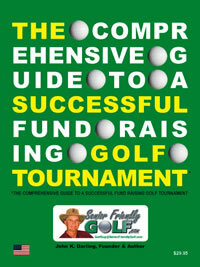 If you are interested in ordering THE COMPREHENSIVE GUIDE TO A SUCCESSFUL FUND RAISING GOLF TOURNAMENT (THE GUIDE), we suggest you read the reviews first. Click Here. After reading the reviews, if you are still interested, there are two formats, the book and the expanded CD-Rom. The expanded CD-Rom includes additional information and photos of over 100 new and exciting products and services. Many companies represented offer direct purchase at discounts or other considerations for charity and nonprofit organizations. The CD-Rom also allows reprinting for distribution of appropriates parts to golf Committee members. We guarantee your organization will benefit from the use of THE GUIDE. THE GUIDE book format is available on the following web site from both Barns & Noble and Amazon.com ($21.86). There is also an ebook version ($5.00) you can read but cannot print. The publisher is Outskirts Press, Inc. Denver, Colorado. $29.95. If you wish to buy only one CD-Rom you may do so at the regular retail price of $29.95 through the form below. The BEST OFFER is the combination of both the book and the expanded CD-Rom for $44.95 and no Shipping and handling cost. This is a $59.90 value. 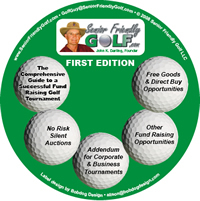 Email the author, John K. Darling, GolfGuy@SeniorFriendlyGolf.com. For autographed copies direct from the author email GolfGuy@SeniorFriendlyGolf.com. Both the book and CD-Rom retail price is $19.95 from the author. Tax and S&H may apply. The CD-Rom is available for resale on a buy-one-get-one free basis with a minimum of five ordered. The BEST OFFER is the combination of both the book and the expanded CD-Rom for $39.95 and no Shipping and handling cost. This is a $59.90 value. Colorado residents add 7.4% tax ($32.17 total plus $4.95 S&H). Buy 1 get 1 free, plus S&H.